Former British Formula 1 racing driver Johnny Herbert is still very closely involved with the sport, and as such makes a great and informative after dinner speaker. Johnny has a lifetime of racing experience to call upon for any corporate engagement, TV appearance or related product launch you may be planning and is currently one of the core presenters of Sky’s F1 coverage. Widely regarded as one of the most talented all round racing drivers in British history, Johnny started his career in karting at the age of ten in 1974. Four years later he was already British Junior Karting Champion, then Senior Champion by 1979. After a successful period in Formula Ford, Johnny graduated to FF2000 and then Formula 3 a year later. Then came another career defining break – Eddie Jordan was so impressed with Johnny’s talents he signed him up for the Jordan team in 1987. They did well in the 1988 season in Formula 3000 and finally, in 1989, Johnny got his F1 break with the Benetton team. Whilst over coming a number of injury difficulties, Johnny stepped away from F1 to full recover, then returned in great style to the Benetton team and won the British Grand Prix in 1995. 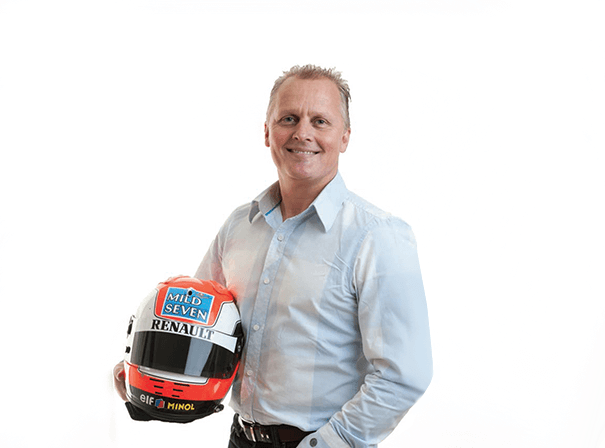 Now an advisor to Formula 1 race stewards, Johnny Herbert is a much-loved figure on the scene who can add plenty to any event, ceremony or corporate function you are planning.